here's a conundrum: Tom Binns t-shirts £120 a pop. The thought process here is that not everyone can spend £500 and above on one of his gorgeous statement necklaces. So instead you can bag Tom Binns t-shirt with a necklace print...hm...don't think so. 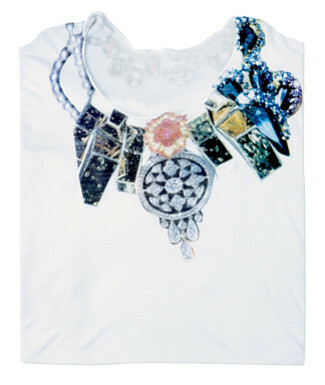 I want the real necklace big time, and would defo turn to High Street for funky print tops (take Debenhams for example).